Whether crossing a creek or caught in a downpour, the Covert GORE-TEX® Sock is designed to enable any motorcycle boot to be fully waterproof. Upgrade to any non-waterproof motorcycle boot. Waterproof - unless in water over the top of the boot. 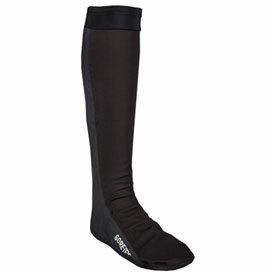 Like the title says, it works well until you find yourself standing in a puddle of water or water crossing where the water level is above the top of the sock, which I found is about the same height as the top of the Comp5 boots I was wearing. Then it just served as a water balloon. But, otherwise, it kept my feet dry and warm when dealing with normal wet riding conditions but I think it’s a bit pricey. Bought mine here on RMATV three years ago and they were $99 then. Unlikely that any improvement would warrant a 1/3 price increase. Which size do I purchase for 9 1/2 size foot? BEST ANSWER: I would suggest going with a medium as these will fit a size 7-9 and if you go to the large, they are going to be way too big.